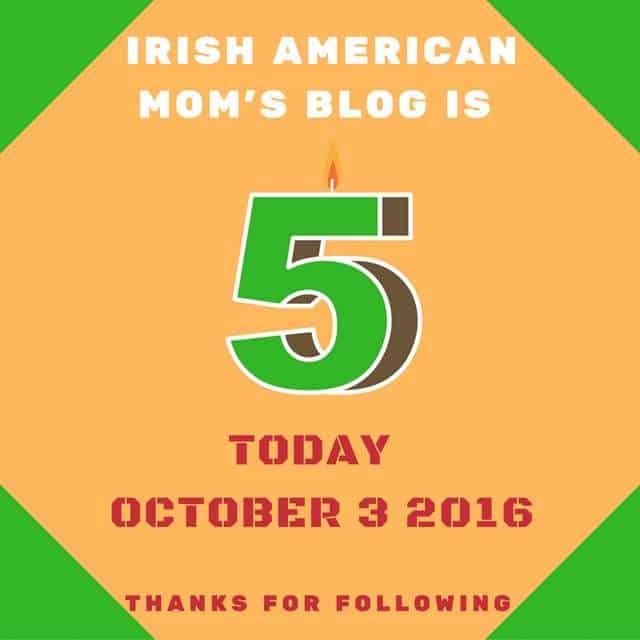 Today, October 3rd 2016, marks the 5th anniversary of the publication of Irish American Mom’s very first blog post. Wow! Where has time gone? I can’t believe it’s been five whole years since I first started this crazy blogging journey. 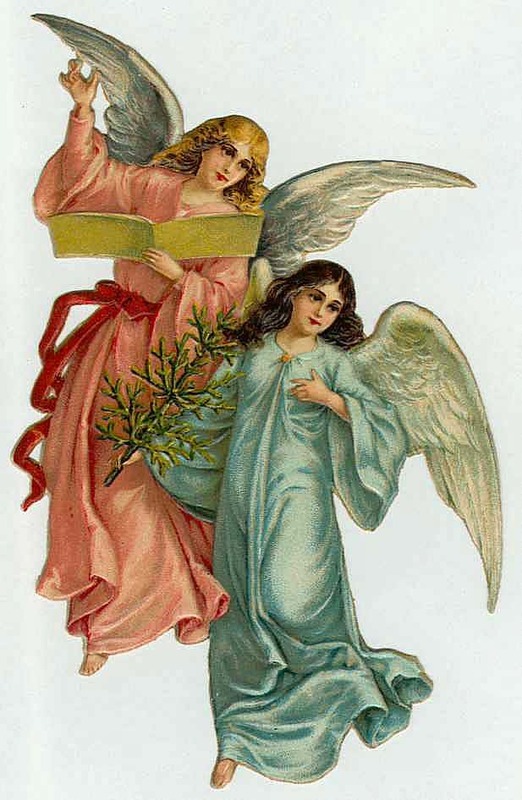 Thank you to all who stop by to read my ramblings. Today I am writing this post to acknowledge all of you, who visit my website, who read along, who join in our little discussions, and who give me kind words of encouragement. This blog would not be possible without you. 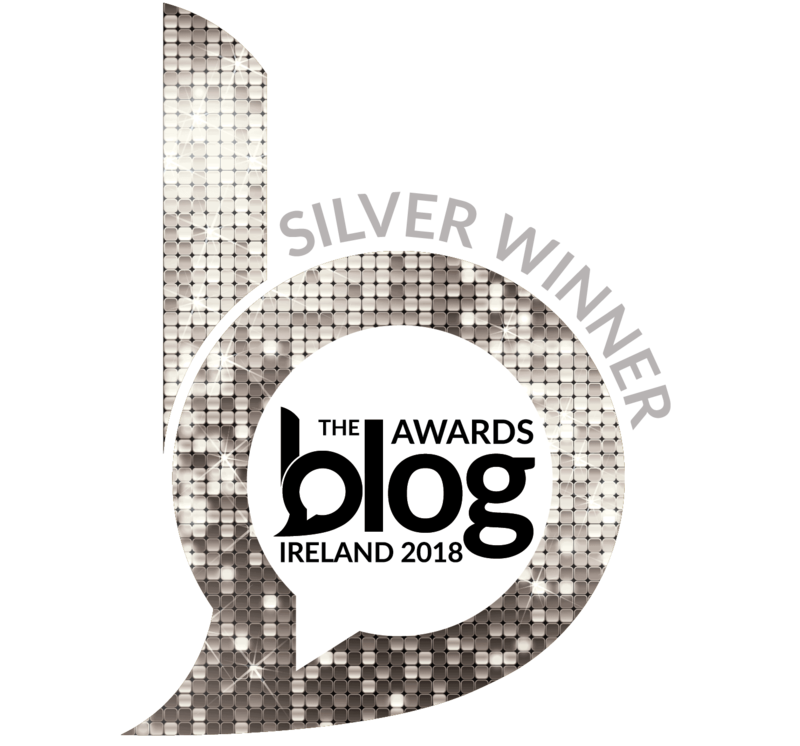 I may have created this little corner of the world wide web five years ago to share my ideas, and sometimes quirky views of Ireland and the Irish in America, but it is readers, like you, who make it all worth while. My virtual blog door is always open, and you will always find a hundred, thousand welcomes here. Remember, together we make this blog happen. Without you I definitely would not be blogging. And so, on this 5th anniversary of my blog I simply want to say thank you. Thank you for stopping by, for reading my ramblings, for subscribing to my e-mail updates, for following me on Facebook, Twitter, and Pinterest, and for commenting. Thank you for your kind words of support, for sharing your love of Ireland on my blog, and for your lovely e-mails. Thank you for all your likes and shares on Facebook, your replies and retweets on Twitter, and your pins and repins on Pinterest. Creating, cooking, editing, and sharing recipes, photos and stories on Irish American Mom takes quite a bit of time each week. Knowing how much you enjoy my recipes and ramblings gives me endless encouragement to keep on going. As a busy mom of four, it can be difficult to juggle everything and keep this blog ticking over. Sometimes I might feel discouraged by negative comments, or get overwhelmed by that infamous Irish Catholic guilt. I might mentally beat myself up because I think I’m not doing enough or writing my posts to the very best of my ability. Lately I have read articles claiming blogging is dead, and the only way forward is through video and podcasts. My heart sinks a little because I feel I’m only just beginning to feel competent as a blogger. As someone who loves to ramble and write, blogging is the perfect fit for me, not video taping. And so, you can understand why I feel a little pang of despair when I realize I’m an old-fashioned blogger. But the amazing thing is, my self-reproach and disillusionment lift once I connect with readers. 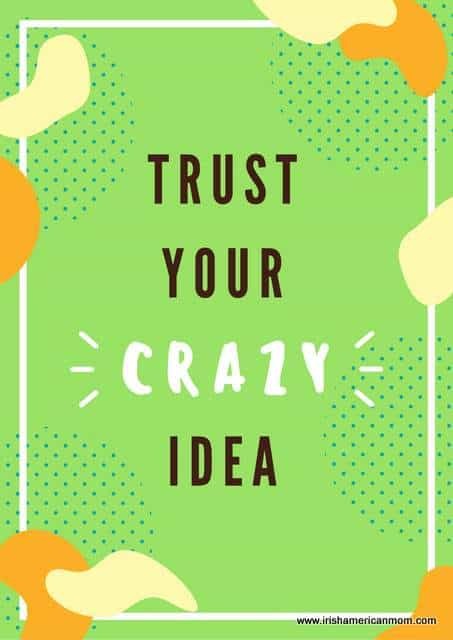 I feel reassured when I hear from you, when I consider the wide variety of blog posts viewed by readers each day, and when I see your likes, shares and comments. Your support motivates my to keep moving forward on this blogging journey no matter what the experts say about the future of blogging. With your help, I continue to learn and improve, even when the technical side of managing a website frustrates me. Because of you, I keep getting better at this whole complicated thing we call blogging. I feel like we are kindred spirits. Reading the comments on my blog is like having a cuppa tea with good friends, very kind and thoughtful friends who make blogging fun. And so, as I celebrate this little milestone on my blogging journey, I say thank you for a wonderful 5 years of blogging. Let’s raise a virtual glass or cuppa, and toast our blogging future together. Here’s to exploring all things Irish and Irish American for many years to come. Congratulations! I so enjoy joining you on your ramblings and wish for many, many more years of rambles together! 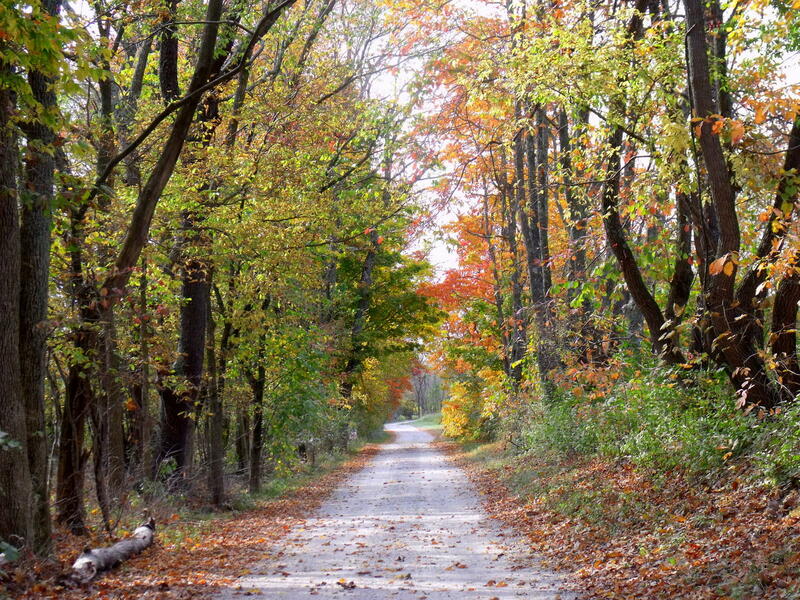 Hi Carol – I’m delighted to hear you like to come rambling with me through Ireland and America. Thanks so much for following. As a person whose DNA says I am 53% Irish, I want to say keep blogging! Love hearing about the land our ancestors come from. Having visited Ireland twice, I felt like I “went back” for those dear ancestors. I went with 2 daughters, and three grandchildren. What a joyful time we had retracing steps. God bless you in your efforts. They are greatly appreciated by me. Hi Pat – So glad to hear you had such a memorable time in Ireland retracing the steps of your ancestors. Thanks so much for following my ramblings. Really appreciate it. Happy Anniversary Mairead 🍀 I have loved tagging along in your adventures and trying your amazing food. I know when I see the blog it’s going to be entertaining! I hope your blogging for another five! Hi Pat – I’m so glad you decided to tag along on my rambles. Here’s to many more years of blogging, until the next big technological advance comes along. Thanks so much for stopping by to mark this anniversary. I hope the written word never goes out of style. Podcasts and videos are nice but there is something so much more personal in well organized thought and perfectly chosen words. You may call them ramblings but they are lovely collections of thoughts! I know I’m not alone in saying thank you for sharing them. Congratulations on 5 years of a labor of love! That’s a lot of laboring!! Congratulations on 5 years of blogging! It’s not always easy to keep blogging, but you do a great job and I always enjoy your posts! Congratulations and Happy Anniversary Mairead! I am so grateful and very much enjoy your blog. Having some Irish in me from my father’s side of the family, I have embraced anything Irish and love getting as much of it as I can. I was fortunate enough to go to Ireland this time last year. I would love to go back again. Thanks to your blog, if I ever do, I will know so much more and the best places to go. Your writings are always interesting, informative and fun and I love the addition of the gift shop. 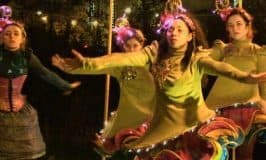 It is hard finding Irish connections here in Maryland, but thanks to your wonderful blog, I feel a little closer. As long as you enjoy blogging…you’ll have many fans reading 🙂 God bless! Hi Sheila – I hope you do make it back to Ireland someday. It’s lovely to hear that you enjoyed your first trip to my homeland, and had such a lovely experience that you wish to return. I’m so happy that I can bring a little bit of Ireland to your through my blog. Hi Mary – Thanks so much for checking out my recipes and ramblings. Glad you like to cook Irish recipes. I have so many more recipes I hope to share – I just need to get photographing as I cook each week. 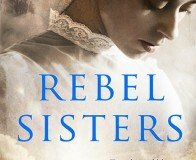 Congratulations, Mairead–so glad to have discovered you! I raise a pint in your honor: Sláinte! Thanks so much, Bill. Sláinte to you too. I’m delighted you found my website where we can share ideas and stories about Ireland. Congrats on five years. I made your buttermilk scones on Saturday as it was raining cats and dogs in South Shore Boston. I will think of your success and toast you with my tea and scones. Thanks for the toast – enjoy your cuppa with those scones. They always taste best when it’s raining cats and dogs outside. Thanks for following my recipes and ramblings. Happy Anniversary Mairead, Amd please do keep blogging! I always feel up,often when I read your blog! It brings back such beautiful memories of Ireland! You do a great job of it! You go girl! Thanks for your kind words and encouragement. So glad to hear my blog posts rekindle fond memories of Ireland for you. Hey! My blog turned 5 in August! Happy blogging anniversary to you, my friend! Likewise Kay – I always enjoy reading your blog posts. And it’s lovely to know that you too are still blogging, and creating a record of your thoughts and musings over the years. I truly believe when I finish this journey I will have a written legacy to pass on to my children. I think my comment might have vanished, but I wanted to say Happy blogging anniversary to you! Hi Kay – I love how you call your blog your baby. Such a great analogy. Don’t we worry and care for them and treat them like our babies. Happy blogging to you too, and here’s to many more years of your stories about life in Georgia and England. I LOVE your stories and thoughtfulness. Congratulations & thank you for allowing me to feel like I’m there with you for a few minutes. I love your writing about Ireland, you bring it to life. My mother was born in Ireland & even though she came & went through my teens & pretty much left when I was 16, I’ve always felt a connection to Ireland. Your recipes bring back childhood recipes & I enjoy your blog very much. I hope to get to Ireland someday but until then I’ll enjoy it through your blog. Hope you have many more years blogging. Hi Deb – I truly hope you do make it to Ireland someday. Your feeling of connection to your mother’s homeland is testament to your strength and your personal understanding of your mother’s reasons for leaving. Thank you for checking out my recipes – so happy they remind you of the food of your childhood. And thank you for joining me as I ramble around Ireland and share my memories of my Irish childhood, and my pride in my Irish heritage. Congratulations on your blogging anniversary! I only found you about a year ago. Please don’t stop writing. i love your recipes, your photos, and all of your ramblings. You bring Ireland to life for me. My mother was so proud of her Irish heritage. Her Dad (my grandfather-Daniel Bonner) was from Donegal. I know she would have loved everything you write here. I always feel a bit closer to my mother, grandfather, and grandmother (who was born in Ireland but moved to England as a young girl) when I read your blog posts. Thanks for taking the time in your busy schedule to share with all of us. Hi Linda – Your grandfather’s name is a true Donegal name. My husband knows many Bonners in and around Letterkenny, where he was born. I’m so glad you enjoy my writings, and that these simple blog posts “bring Ireland to life” for you. That is high praise indeed. Thank you so much. Blessings to you and yours and here’s to many more years of stories to share about Ireland. Congrats Mairead for sticking with it all this time. Huge congrats on 5 years, that’s a great achievement. Thanks a million, Lorna. It’s a good milestone to have reached. Congratulations Mairead! So glad I discovered your lovely , warm, friendly blog. You write in that uniquely Irish style which we would not appreciate to the same degree from a video. I so look forward to your posts, they feel like a message from family and are so interesting and varied. my Irish parents are gone now and you help me keep my Irishness (of which I’m very proud) alive in me and I thank you for that. Hi Bernadette – I’m so glad you enjoyed those audio clips I did of the Irish sayings. I love your suggestion of doing the same for some Irish Christmas greetings. Thanks for following my stories, and for joining our little Irish clan here on my website. Let’s continue to celebrate our Irishness together. Happy Anniversary! I’m so happy we “met” online a few years ago and discovered your little corner of the world. Please keep blogging and know that LOVE reading your writing and have very little interest in videos. Do it your way, do it well, and people will follow. 🙂 Slainte! Hi Sophie – It’s been lovely to meet you too online. Thanks to the power of the internet we “meet” kindred spirits who share a love of the magic and mysticism of Ireland. It’s simply amazing. “Do it your way, do it well, and people will follow.” – That’s a wonderful quotation and tip for any blogger. Thanks for your insights, and thanks as always for following. I sure will, Deborah, especially since our little clan of ramblers keeps on a growing. Thanks for following. Congrats on your 5-year milestone, Mairéad! As a blogger myself, I totally understand the occasional discouragement you feel. I know blogging is not as big a thing as it used to be, but it’s still a great way to keep fresh content on your website and some folks are indeed reading and being blessed in the process. Knowing that helps keep me going. Here’s to continued joy in your blogging journey, my friend! Hi Cheryl – Thanks for your wonderful words of encouragement. 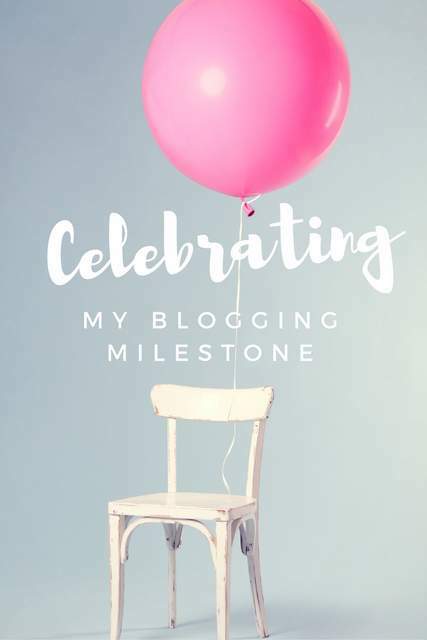 I think you have hit on a key point about blogging when you say “here’s to continued joy in your blogging journey.” Finding joy in the process is so important, and I am so happy to say that through blogging I find great satisfaction, blessings and a feeling of connection with others who appreciate life and all that God gives us. It truly is a journey of blessings. or coffee in my case, with a friend. It will never be replaced so no worries. get me thinking of our origins. You have really been a resource for so many of us and probably in ways you hadn’t imagined. Tenfold! I’ll put on the coffee, and the kettle. Hi Penny – Here’s to many more cuppas while reading the comments here on my blog. My mom once told me she looks forward to reading the comments on my blog posts even more than reading the actual blog posts. She explained how the comments take an idea to another level of personal experience, with a wide variety of interpretations from readers around the world. I too love when readers share their stories of self discovery and understanding of their Irishness. Thank you for all your insights into your Irish American family, and here’s to many more years of discoveries together. I think I’ll put the kettle on too. Congrats, Mairead*! 5 years is quite an accomplishment! 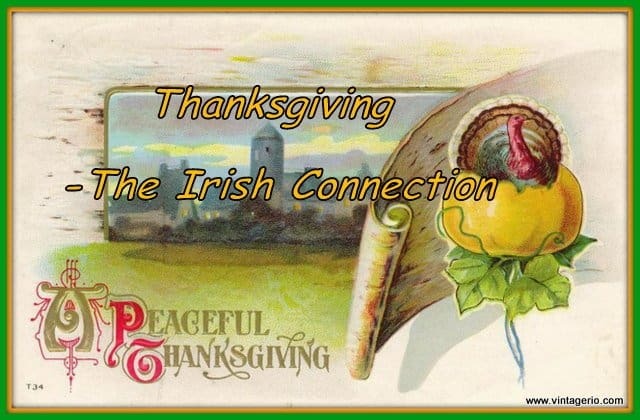 Hi Irishannie – I’m so glad you stop by for our Irish chats and virtual “cuppas.” It’s always lovely to hear your take on all things Irish.